Opp+Ned offers guided climbing og skiing with an internationally certified Mountain Guide (IFMGA/IVBV) in the beautiful and wild mountains of northern Norway. Summit to sea skiing in Narvik and Lyngen, or climbs to Norway`s national mountain of Stetind are examples of the adventures that we can offer you but the mountains up here in the north are almost limitless in abundance and the possibilities are equally rich. Join us on an adventure into nature and up on the mountain! 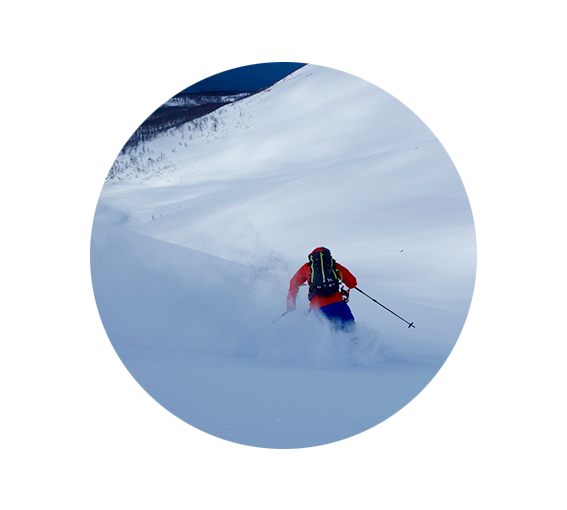 Opp+Ned offers guided ski tours with an internationally certified Mountain Guide (IFMGA-UIAGM-IVBV). Our main areas are Lyngen and Narvik, but we can also provide a guide for ski tours in other areas, such as Lofoten, Tromsø and Senja. We adjust the tours and arrangements to our guests wishes, needs and skills, and of course to the current weather and snow-conditions. Our main objective is to find the best snow for skiing and have great days out in the mountains! 3500,- NOK for the guide plus 400;- NOK per guest. Maximum 6 guests per guide. There is a discount on bookings of 4 days or more. Opp+Ned wishes to contribute to a more sustainable tourism for the future by offering a 20% discount to all guests who chooses alternative ways of travel instead of airplane such as bus, train or boat (Hurtigruten). Opp+Ned can on request offer a vide range of courses in the mountains tailored to your wishes and requirements. This includes courses in avalanche awareness, ski mountaineering, glacier travel and different types of climbing, from sportclimbing to ice climbing and (more or less) everything in between. There will be a variety of different courses in Narvik and Harstad in the winter of 2018/2019. Dates and more information to come! to the summit of Norway`s national mountain, Stetind. Stetind is an almost 1400 meter high granite monolith in the municipality of Tysfjord about an hour drive south of Narvik. The mountain is an impressing sight in itself, but the view from the top is an experience for life! The season starts in July and lasts through September. We offer a 15% discount on bookings for weekdays! Information on tours and prices below. The climb to the summit starts at the parking lot beneath the west ridge of Stetind, just by the shoreline. From here there is an approximately three to four hour hike to the east summit, known as Halls fortopp. The last leg to the main summit goes along the east ridge, also known as the Normal route. The climb along the ridge is for the most part comprised of easy, but airy scrambling. There is however a marked crux about half way along the ridge, known as Mysosten. Here you have to climb up a 15-20 meter slab at norwegian grade 4+ with an 800 meter drop straight down to the valley floor beneath you. To be able to do the climb you have to be used to long hikes in rugged terrain. You do not need to be an experienced climber, but you should feel comfortable in airy and exposed terrain. Elevation /length: 1400 meters / 10 km. Time: 9-12 hours. This includes all necessary climbing equipment and guide. All expenses for the guide is included in the price. Stetind South Pillar was first climbed in 1936, and is one of the most classic multipitch climbing routes in Norway. The climb has about 14 pitches which involves climbing up to Norwegian grade 6, but most of the pitches is in the 4 and 5 area. The route follows the marked pillar that protrudes out from the south face of Stetind and follows cracks, slabs and dihedrals on perfect granite from a ledge known as Kongelosjen, about 900 meters about sea level, all the way to the summit. To be able to do the climb you have to be in good shape, used to hiking and scrambling in airy and exposed terrain and feel comfortable following on climbing at Norwegian grade 6 (French 6A). Elevation /length: 1400 meters / 10 km. Time: 10-14 hours. Opp+Ned Fjellføring is a guiding company that offers all season mountain guiding in northern Norway. It is based in Narvik, and is owned and run by Marius Opdahl Larsen. Marius is an internationally certified Mountain Guide (IFMGA-UIAGM-IVBV) through the Norwegian guide association Nortind. He also works as a field observer for the Norwegian avalanche forecasting service in the region of Narvik.